Home » ?? » Is life a game of chess? There are many similarities; we live on the earth with its boundaries, borders & parameters. Like a chessboard the daily news broadcasts bombard us with incidents that are often very black & white. Each day we face daily challenges, obstacles, tests & trials & often have to work through them by action & deed. The chess player will use his brain to work things out, using logic & strategy, & will make decisions to advance his pieces in such a way as to gain position. In the same way we have to make decisions on a daily basis, big & small ones as we journey through our lives. Sometimes we get counsel & advice from others more experienced than ourselves to help us make our minds up when we cannot decide. Supposing there was a key issue, a key question to consider. For many people they would say the most important decision to make in their life. Ultimately it is your decision to make, no one can make it for you. Like all decisions you should weigh up the situation, look at the whole chessboard, before making your move. Talking to other people would be an important part of the search for the right decision, reading up on the matter, researching on line, listening to all the schools of thought on the subject & then ultimately making your personal decision. You see, to make no decision is not good, it is effectively a dangerous game to play, & it is like allowing your clock to run down in the game of life. A chess player can be winning the game but lose on the clock. If his clock flag falls he loses the game, so to not make a decision allows seconds of your clock to go. Those seconds soon accumulate to hours, days, weeks, months & even years, before long decades could go by & suddenly life’s end faces you! Many people make the decision before the age of 20 years, whilst some make the decision on their deathbed leaving it rather close to the end game! So the important decision, the decision of life, what is it? The bible, the world’s most influential book explains it clearly: ‘For God so loved the world that He gave His only Son, that whosoever believes in Him shall not perish but have eternal life.’ – John chapter 3 verse 16. God gave His Son, Jesus to be the one who would come & ultimately die on the cross for all who have sinned & done wrong before a holy God. Sometimes a chess player will sacrifice a piece to gain advantage, to open the way & ultimately win the game. God was prepared to do that too, it cost the life of His Son, Jesus. God had a plan of redemption for all those who would believe in Him through His Son, Jesus Christ. He had a plan to raise His Son from death after 3 days. Jesus overcame death, darkness, disease, & sin for you & I, a unique death that was acceptable to God the Father for all mankind. Any therefore accepting this sacrifice for them & believing & confessing Christ Jesus, as their Lord & Saviour would be given new life in Christ by the work of God’s Spirit within. The bible says that our sins would be forgiven & we would be filled with the Holy Spirit, a down payment & a deposit of what is to come. The bible says that Jesus is the King of all kings, Lord of all lords & one day all will bow the knee before Him. We can get to know Him by inviting Him into our lives by His Spirit, making Him Lord, allowing Him to sit on the throne in our lives. 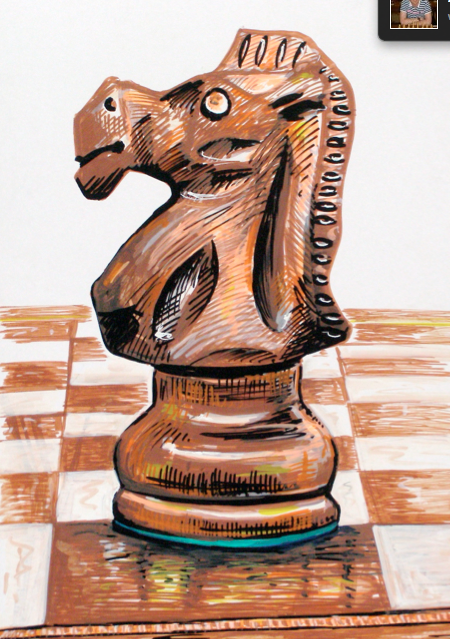 Kevin has written & illustrated a helpful resource called Checkmate. The Checkmate gospel as it is known is helpful in making links between the most popular board game in the world & the most influential book in the world. To order please contact Kevin, donations to Face2Face Educational Trust, please. 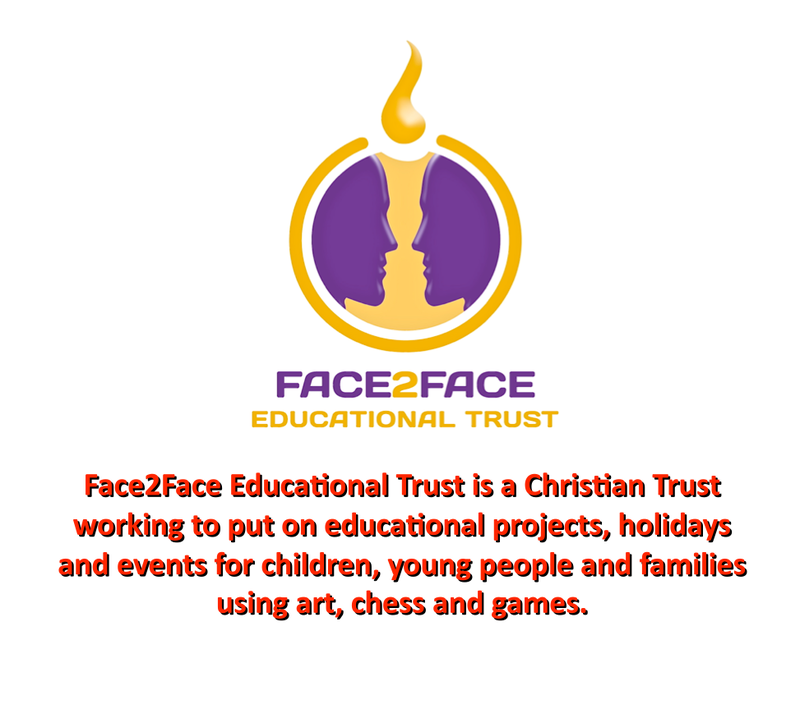 Kevin works for Face2Face Educational Trust & runs projects for children, young people, adults & families. He leads two young people residential holidays in chess & art each year. 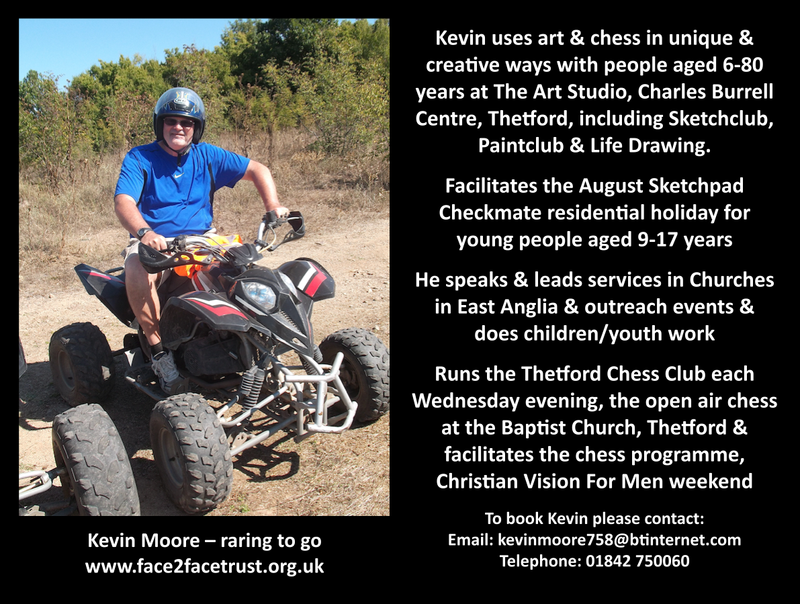 Kevin teaches art & chess in schools & churches, is a versatile artist & available for bookings. 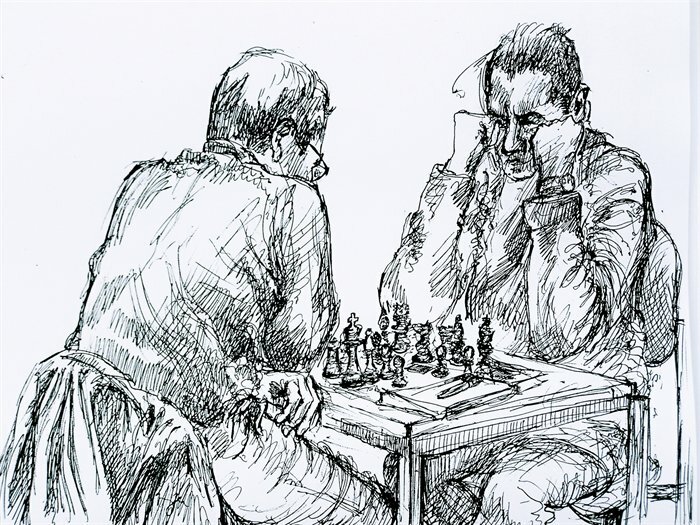 Have you thought of using chess or art in reaching out to people in your community?